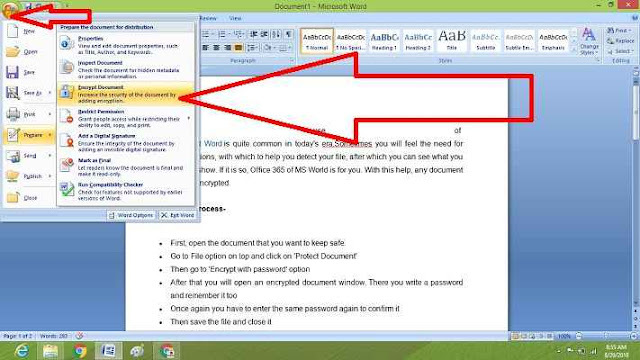 The use of Microsoft Word is quite common in today's era. Sometimes you will feel the need for such options, with which to help you protect your file, after which you can see what you want to show. If it is so, Office 365 of MS World is for you. With this help, any document can be encrypted. First, open the document that you want to keep safe. Now by opening the file again, you will find that he will ask for the password. There you have to write the password that you set up. What to do to delete a password? Click on 'Encrypt with password', then a new window will open. There will be some dots in place of the password, delete them, and then click OK.
Save and close the file again. Now open the file again, it will open the directory without asking for the password. Keep in: mind that while keeping a password, keep in mind that it is not so easy that anyone can crack it, but it should not happen that you forget it yourself. Because there is no option to reset password here. In such a situation, you will never be able to open your own document.